Hong Kong is a metropolitan city with a high population density and a well-developed public transit system. Many people employ one or more mode(s) of transit during their daily commutes and during these periods they are exposed to varying degrees of pollutants of health concern that originate from nearby traffic exhaust and other ambient sources. Many also wait or walk in street canyons where emissions from nearby traffic may accumulate. In this study we evaluated the concentrations of ultrafine particulate matter as well as particulate-phase black carbon (BC) present during various commute activities and how the commute modes impacted these concentrations and exposure to the commuters. Multiple commute routes were selected to reflect several typical patterns, including to and from residential areas, industry areas and dense urban commercial districts. We outfitted a wheel-equipped suitcase with a portable condensation particle counter for ultrafine particle (UFP), a Micro Aethalometer (for BC), as well as a monitor for carbon dioxide (CO2), carbon monoxide (CO), temperature and humidity each recording data with high time resolution of one second. Location data were noted and associated with pollutant observations. 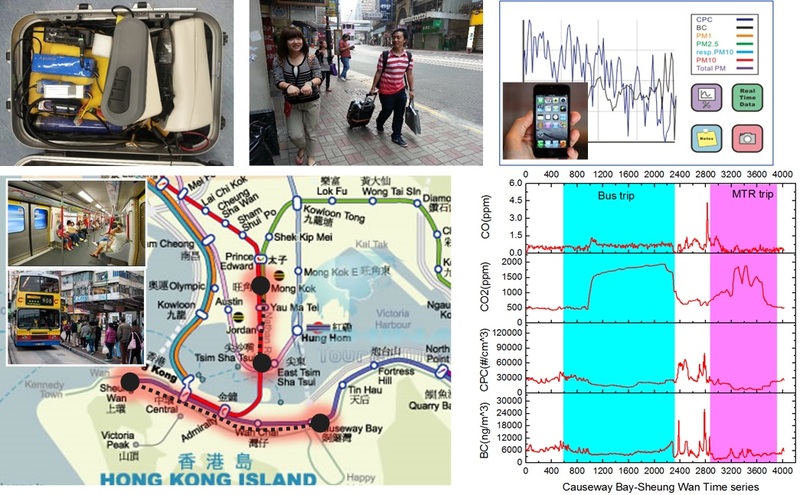 Data were collected while at the street waiting for buses, while in buses (liquefied petroleum gas and diesel powered) as well as on MTR platforms during waits and transfers and in MTR trains. Statistical analysis was applied to the measured concentrations in various microenvironments for comparison of passengers’ exposure to pollutants and the possible sources of the pollutants. In addition to the comparison of stations and stops, the in-cabinet passenger exposure to air pollutants was also assessed in MTR trains, franchised diesel buses and LPG mini public buses. Lastly, two typical travelling routes from residential to business districts were selected in Kowloon and Central districts to investigate the comparison of total integrated dose of exposure to the pollutants by MTR or by buses taking into count of the time activity and microenvironment pollutants concentrations. Among different environments during commute, BC and UFP at bus stations and in enclosed terminals were routinely the highest with the mean BC values of ~20 μg/m3 and UFP of ~40,000 particles/cm3. BC concentrations in trains were much lower than for buses; however elevated levels were seen at several station platforms, especially above ground platforms in the commercial centres. High peaks of BC nearly 25 μg/m3 were also found inside MTR cabin when passing a tunnel but with low level of particle number concentrations. There was a range of BC levels measured while in diesel powered buses with mean values differing by a factor of 6 between the lowest and highest values in buses taking the same routes. CO concentrations were found to be elevated above ambient inside several of the natural gas powered minibuses with an average value of close to 3 ppm and the highest reaching 40 ppm. These elevated CO levels indicate poorly functioning exhaust systems and apparent leakage of exhaust into the passenger cabin. Figure 1 shows the typical pollutants concentrations of BC and CO inside the cabinets. Pollutant levels encountered while waiting for buses at roadside comprised approximately 60% of the overall exposures during a bus commute. 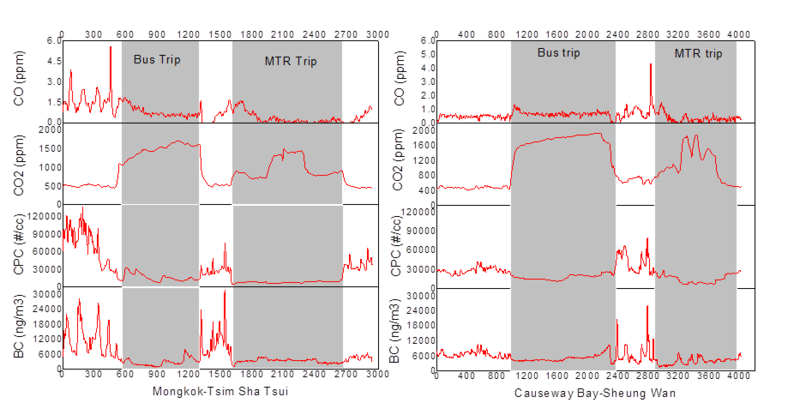 Figure 2 shows the comparison of the time series of the air pollutants concentrations expose to passengers taking bus and MTR train, respectively, in a typical urban district. High traffic volume of vehicles passing by and the idling of buses next to the stops while passengers wait for boarding the bus causes high concentrations of BC and CPC with large fluctuating (BC peaks at 30,000 ng/m3 and CPC exceeds 100,000 #/cm3). Both pollutants decreased sharply after getting on the bus and remained at a lower level (BC stays at 3,000 ng/m3 and CPC remains at 17,000 #/cm3) during the rest of sampling time. The MTR trip was observed to reflect a flat trend for BC (at 3,000 ng/m3) and CPC (9,000 #/cm3) throughout the whole sampling time. The total exposure to particulate pollutants was about half by MTR compared with those by franchised diesel buses via the same route from the identical residential areas to commercial districts. The air pollution concentrations in different transit modes are affected by the different infrastructure and urban settings. The in-cabinet exposure to pollution is also affected by the vehicle operation conditions and fuel used. Dramatic difference in exposure levels to different pollutants may have differential implication to health effects given long term personal exposure to pollution in public transit systems in metropolitan cities. The project is financially supported by the Health and Medical Research Fund 10112061.